Goals from Theo Walcott and Olivier Giroud won the game, and Arsenal move four points clear of Manchester City. Arsene Wenger named an unchanged side, the XI he’s depended upon in recent weeks because of injury problems. Alexis Sanchez wasn’t fit enough to make the squad. Manuel Pellegrini welcomed back Sergio Aguero from injury – although, as always with the Argentine, he looked badly short of sharpness in his first game back. Pellegrini handed a start to Fabian Delph, who was surprisingly named in a narrow left-sided role, rather than as conventional central midfielder with Yaya Toure pushing forward, as one might have expected. Raheem Sterling was therefore only a substitute. The fascinating thing here was the fact there were various stages which unfolded as the contest progressed. In isolation the first half hour wasn’t particularly interesting, but it was about two good sides attempting to figure one another out, before pushing forward and attacking more frequently later on. This is generally preferable to the reverse: a game which starts at 100mph but then peters out frustratingly. This game wasn’t about a clear pattern or a key area throughout – it was about the progression. It was most interesting, though, in the first half. 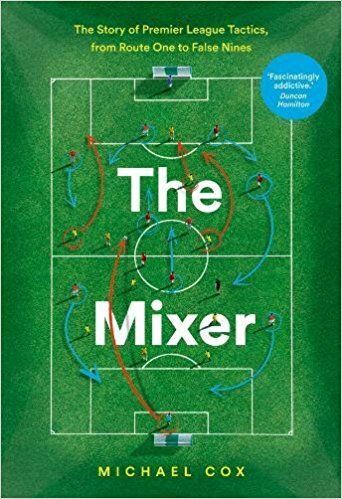 Both clubs, at various points, have been criticised in recent years for their poor defensive shape and overly ambitious use of possession in big matches, but this game was the complete opposite. Without possession both teams sat back in two banks of four, with the attacking duos also getting back into deep positions too. 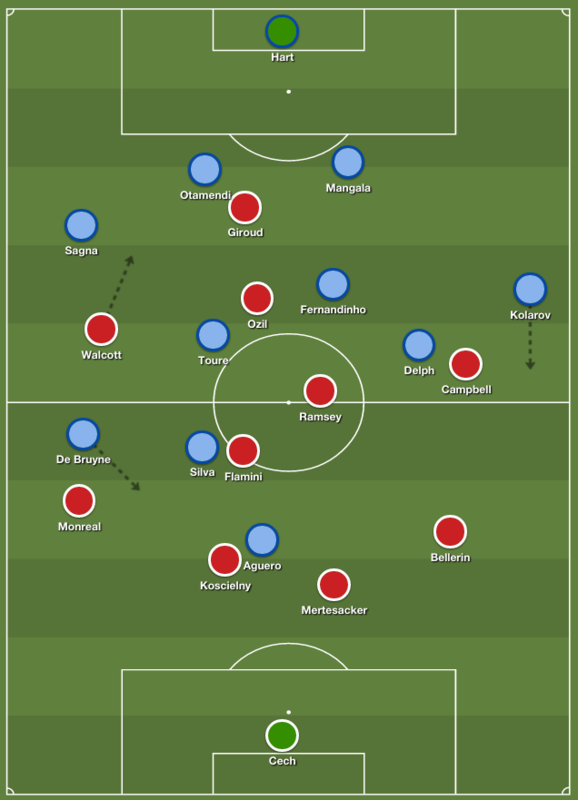 Arsenal tended to play short passes between their two centre-backs and central midfielders without much determination to get the ball into the final third, whereas City looked to release Aleksandar Kolarov down the left. With Delph tucking inside, Kolarov had the most space of anyone on the pitch and needed no second invitation to overlap. This game featured the Premier League’s two most dangerous playmakers, Mesut Ozil and David Silva. They both played the number ten role, and with the wide players forced to get back behind the ball, Ozil and Silva were both teams’ best chance of launching good attacks. City kept it very tight between the lines of defence and midfield, making it difficult for Ozil to collect a pass between the lines, in his favoured zone. Arsenal’s defensive approach was different, with Mathieu Flamini sticking very tightly to Silva as he wandered across the pitch, effectively performing a man-marking job at times. Silva tended to come deeper to find space away from Flamini, who didn’t want to advance too high up the pitch, and therefore was more visible than Ozil during the first half hour. Silva struggled to link up with Aguero, however, and in the opening period the game’s key player was probably Kevin De Bruyne, who was forced to defend deep but sprinted forward dangerously too. Nacho Monreal was caught too high up the pitch a couple of times, and De Bruyne was also afforded space because of the fact Laurent Koscielny was trying to stick tight to Aguero. With he and Flamini watching other men closely, De Bruyne wasn’t shut down properly if he moved inside slightly. The Belgian missed the game’s most presentable chance – just two minutes before Arsenal took the lead. Monreal challenged Bacary Sagna high up the pitch, but City came away with the ball and played a quick pass to Aguero. He came short, dragged Koscielny up the pitch and knocked a pass into De Bruyne, who dribbled 50 yards down the right completely unchallenged, before firing narrowly wide of the far post. Per Mertesacker, the covering defender, was left stranded by Koscielny’s sudden burst to follow Aguero, but did excellently to block off the passing angle to Silva. That miss proved crucial. 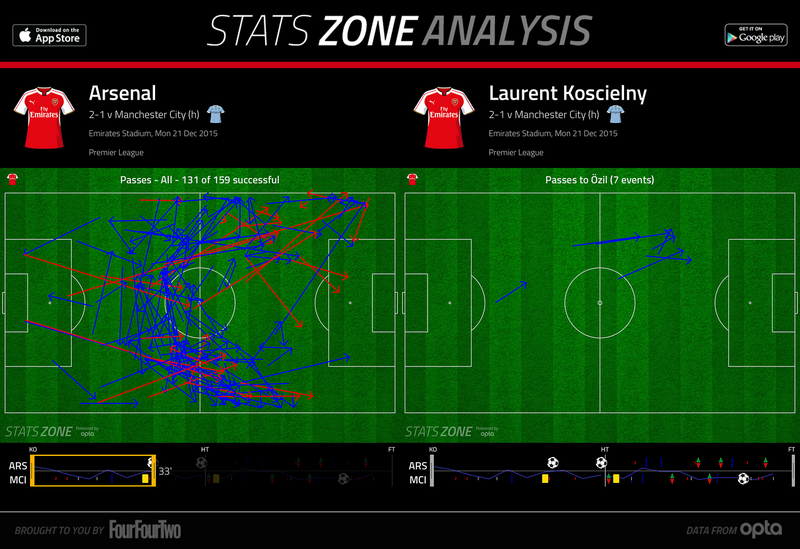 Koscielny was also very interesting in possession. Because both sets of forward duos were looking to drop back and protect the midfield rather than pressing the opposition centre-backs, all four centre-backs had plenty of time on the ball. But whereas others used the ball cautiously, Koscielny was determined to exploit this freedom. On various occasions he moved forward and then hit a good pass into the final third, or dribbled forward ambitiously. This was particularly important for Arsenal, who are lacking a true ball player from deep in the absence of Santi Cazorla (and Mikel Arteta), and Koscielny proved a useful (extra-)deep-lying playmaker. Walcott’s opener was a superb finish, and Ozil is credited with another assist, but really the key pass was Koscielny sliding the ball quickly into Ozil. The Frenchman seemed the only player who could locate Ozil between the lines, and therefore while City’s defensive shape was largely very good, they suffered because neither Silva nor Aguero was told to stand in Koscielny’s zone when Arsenal had the ball. If they’d blocked off that potential route into the final third, Arsenal might not have taken the lead. The below graphic shows Arsenal’s passing at 0-0 – they simply couldn’t work the ball into dangerous positions until then. Ozil, the number ten, was the most frequent recipient of Koscielny’s passes, which is very unusual for a centre-back. Arsenal doubled their lead on the stroke of half-time, a simple goal after Eliaquim Mangala conceded possession in his own half under no pressure. Again Arsenal were able to find Ozil between the lines, and he slipped in Giroud – who showed good movement to pull into the channel, a key feature of his performance here – before finishing. Pellegrini immediately introduced Sterling in place of Delph, moving to a more conventional 4-2-3-1 system – but this seemed to weaken City’s defence without significantly improving their attack. City’s two banks of four disappeared while Arsenal’s remained intact, and the home side repeatedly counter-attacked dangerously with Joel Campbell twice going close. Aaron Ramsey – who was ineffective in the first half in a very ‘closed’ game where he was unable to bomb forward into space – suddenly became a major player and had arguably Arsenal’s best chance of the second half when the home side overloaded an entirely disorganised City defence. In truth, however, Ramsey probably sped forward too frequently after half-time at a stage when Arsenal needed to close out the game. That was probably why Wenger attempted to make his side more rigid through the use of substitutes. Yet again he brought on Kieran Gibbs on the left of midfield, with Campbell departing. This made it slightly surprising that Pellegrini introduced Jesus Navas almost immediately, as the right-winger was up against two left-backs. Aguero limped off and was replaced by Wilfried Bony, who provided a decent penalty box presence as City often went wider – they were now playing two outright wingers with De Bruye moving into Silva’s central starting position. Wenger went even more defensive by introducing Alex Oxlade-Chamberlain in place of Mesut Ozil for extra midfield energy, and later Calum Chambers replaced Walcott and sat solidly in front of the defence. What really changed the game, though, was Toure’s outrageous sidefooted shot into the top corner. This came out of nothing, and suddenly gave City belief, and forced Arsenal to panic. The final 10 minutes saw the game played almost entirely in Arsenal’s half, with the home side not attempting to retain possession, and lacking quick attackers to offer a threat on the counter. They held on, but it was more desperate than it should have been. The game swung on that two-minute period where De Bruyne missed a glorious chance, then Walcott curled in a wonderful goal. Arguably the key man in both situations was Koscielny – first being turned easily by Aguero and leaving De Bruyne free to run on goal, and then sliding an excellent pass into Ozil, who then played the ball to Walcott. His proactive defending in this game wasn’t effective, but the fact he brought the ball forward was crucial in Arsenal penetrating City’s defensive block. I thought it was interesting that on US TV there was significant criticism of Pellegrini for the inclusion of Delph. They praised the introduction of Sterling at half time, without thinking critically about the fact that it didn’t really seem to change anything about how man city attacked. If anything I thought that shuffling de Bruyne around made him less dangerous, and elimnated city’s major source of attacking danger. At the same time, they were unable to contain Özil with 3 central midfielders, and even less so with 2, while Aguero’s obvious lack of fitness meant City always had to work harder, which isn’t really Toure’s forte. was thinking the same about koscielny, especially the pass to ozil for the 1st goal. the absence of cazorla made him as the playmaking centerback ala jerome boateng, matts hummels or daley blind (*in the early months of the league). 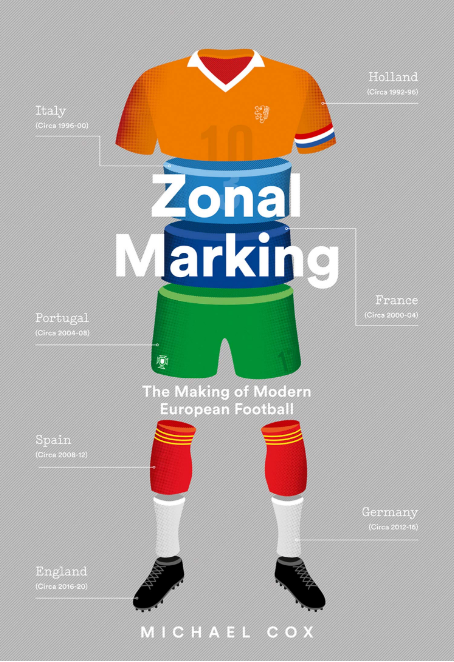 I wish we had more of ZM’s articles….always superb. City are now 11th in the away table..but 1st in the home table. bizarrely just 2 home clean sheets yet scoring a lot. but 5 away clean sheets..but scoring few away ..just 8 in 8.. compared to 25 in 9 at home. i remember talking a few years ago about them on here being so reliant on their key players down the spine…Hart, Kompany, Yaya, silva, aguero. the flaky players like nasri and navas have been upgraded to KDB and Sterling who definitely offer more. Bony is a decent player but being chunkily built doesn’t seem suited to these occasional games…he seems to have a diesel type engine that needs regular games. the title is there for the taking if City could sort out their away form. It has taken the Premier League a long time to produce a centre back, Koscielny, who realises he has the time and space to go forward and play penetrative passes, as he provided for Ozil between the lines, when he has no striker to mark. To think that Beckenbauer was doing this more than forty years ago. Tactical Analysis at its best. Michael, you are no more a tactician. You are just like them journalists who trail behind managers, pick up nose wiped hankies and make stories out of it.